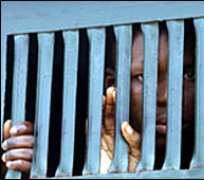 Hundreds of prisoners on Nigeria's death rows did not have a fair trial and may be innocent, rights group Amnesty International (AI) says. AI says many confessions are extracted under torture and people are sentenced to death on that evidence alone. The organisation has called on the government to halt all executions in light of its report. "The judicial system is riddled with flaws that can have devastating consequences," an AI researcher said. "It is truly horrifying to think of how many innocent people may have been executed and may still be executed," AI's Aster van Kregten said in a statement. It details how, after a prisoner has been hanged, other death row prisoners are forced to clean the gallows. "The police are overstretched and under-resourced. Because of this, they rely heavily on confessions to 'solve' crimes - rather than on expensive investigations," Ms van Kregten said. Ledap, the Nigerian legal organisation which co-authored the report, says that under Nigerian law, confessions under torture cannot be used as evidence in court. "Judges know that there is widespread torture by the police - and yet they continue to sentence suspects to death based on these confessions, leading to many possibly innocent people being sentenced to death," Ledap's national co-ordinator Chino Obiagwu said. Amnesty says that death penalty trials can take more than 10 years to conclude, with some appeals waiting for 14 years - and even up to 24 years. "I am not an armed robber. I am a shoemaker. I bought a [motorcycle] from someone who stole it," death row inmate Jafar, 57, told Amnesty. He filed an appeal 24 years ago, but he is still waiting for it to be heard as his case file has gone missing. "The police asked me to be a witness. They got the man who sold [me] the [motorcycle] but shot him to death. After that, I became the suspect." In the report, many prisoners said that when the police picked them up, they asked for money to release them. Those who could not pay were treated as suspected armed robbers, they say.